Paradise Springs Essential Oils are 100% pure, highly concentrated oils rich in natural, aromatic compounds. 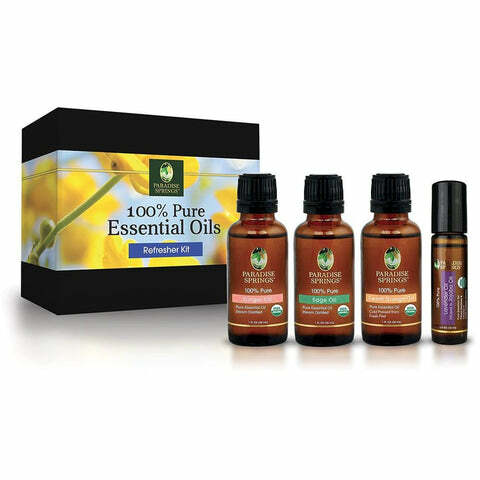 Our premium-grade essential oils are never chemically altered or synthetically modified. Found naturally in different parts of plants, these potent essences are perfect for everything from aromatherapy and skin care to natural home-cleaning solutions. 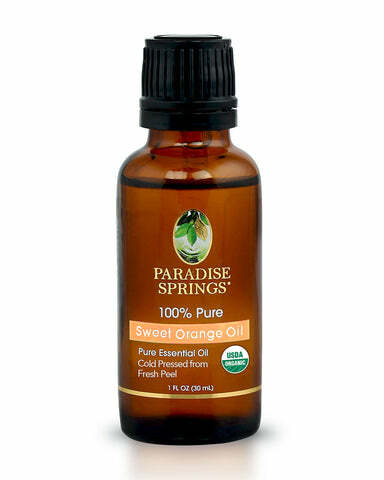 At Paradise Springs we pride ourselves on the quality, purity, and potency of our products. The Paradise Springs Refresher Kit is designed to bring energy and life back into your everyday beauty routine. These three organic essential oils are known for their abilities to uplift the mind, stimulating the senses for a brighter day. The Refresher Kit is packed with rich, woody, sweet, and herbaceous scents that every woman will love. The box includes three one-ounce bottles of some of our most popular, refreshing organic oils with a bonus organic lavender roll-on for added relaxation. Aromatically, the energizing properties of organic ginger essential oil have been known to help revitalize mind and body while relieving anxiety, anxiousness, and exhaustion. Topically, ginger oil can be used to help increase circulation, stimulate hair growth, even skin tone and help reduce the appearance of scars and stretch marks. With both sweet and spicy tones, organic ginger oil is also a great addition to massage oils or a warm bath. In aromatherapy, organic sage essential oil has strong herbaceous notes that can help stimulate the mind and address mental fatigue. It is often used in aromatherapy for its fragrant, rooted scent. Sage oil also contains beneficial properties that help address dry conditions affecting the skin and scalp, such as dry skin and dandruff. Organic Sage Oil also acts as a powerful moisturizer that can protect the skin and help slow down the aging process, among many other benefits. Sweet orange essential oil is extracted from orange peel by old pressing the fruit to obtain this versatile oil. This sunny and radiant oil can be applied topically, as a compress, in the bath, through inhalation, or through diffusion. This powerful oil can help eliminate toxins, boost the lymphatic system, calm nerves, moisturize, and even boost collagen to prevent premature aging. Included with each Refresher Kit is the Paradise Springs Lavender Roll-On. USDA Organic Lavender Oil (Lavandula angustifolia) is steam distilled with cold pressed organic Jojoba Oil (Simmondsia chinensis) to make a calming and aromatic roll-on portable enough to take anywhere. Simply dab the roll-on onto wrists or neck for an easy, all-natural perfume while enjoying the rejuvenating, detoxifying benefits of lavender and jojoba.